Several months ago, I brought the first Airsoft specific review of the STRAC Technologies (StracTech for short) F.A.S.T. System to Airsoft Retreat, where you can read it HERE. I am now happy to bring you the review of the 10-0 Tactical Vest, manufactured for StracTech by Eagle Industries specifically for use with the F.A.S.T. 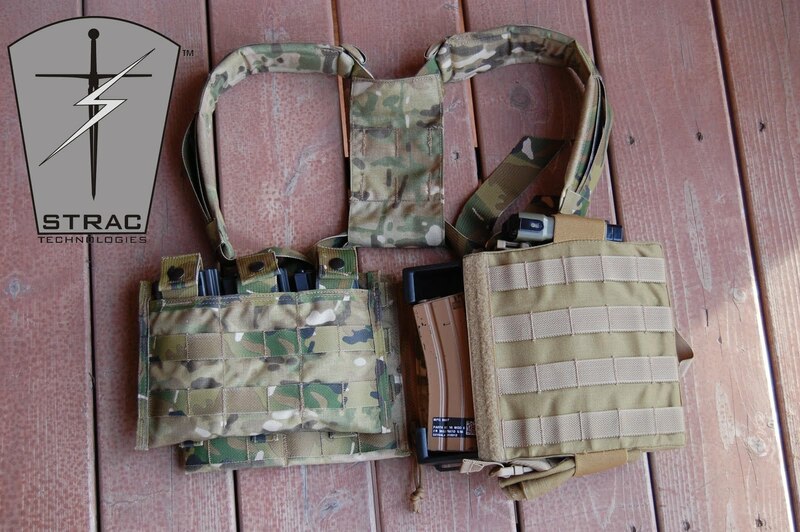 System, but is able to be used as a very nice standalone MOLLE chest rig. I obtained the 10-0 directly from StracTech, at www.stractech.com to review here on Airsoft Retreat. It is available in Black, Khaki, OD, ACU, CADPAT, and Multicam, the pattern reviewed here today. It is priced at an extremely affordable $62.66, and discounts are available for bulk orders, as well as for MIL/LEO orders. "If you don't shoot it, cut it, or blow it up, I will repair or replace, at no charge, any Eagle product that ever fails to perform!" Designed for Military and Law Enforcement use, it has a few features that some users may find interesting. It is designed to sit a little higher than a normal rig, both to allow proper access to the F.A.S.T. System, but also to clear the bulky duty belts that most LEOs wear on the job. It also allows you to sit comfortably in a vehicle while wearing the fully loaded unit; something my compact plate carrier and maritime CIRAS replica do not do. The rig itself is comprised of the two front sections, a lower and upper back strap, a MOLLE rear connecting piece, the shoulder straps, and the shoulder strap pads. It is very compact and lightweight, but is made of 1000D Cordura fabric; in my case, genuine Crye Precision Multicam fabric. The front sections wrap around the torso slightly, and are padded and reinforced in order to keep their shape as well as be comfortable. It features four adjustment points to allow â€œone size fits allâ€ use; the upper and lower back straps, and both shoulder straps. If you take the time to properly adjust both the upper and lower back straps, as well as the shoulder straps, you will find the rig to be quite comfortable while allowing nearly uninterrupted freedom of movement, and easy donning and removal due to the front mounted zipper. The zipper is a pull down type, requiring you to zip it down when donning the rig. Pulling the zipper up unzips it, allowing removal. I can only guess that this is to prevent accidental unzipping due to a snag, and it works quite well. This rig is designed specifically around the F.A.S.T. System, both in the size, as well as the placement of the MOLLE real estate. It is designed to position the F.A.S.T. System high and to towards the center of the torso, where it was engineered to be the fastest and easiest to access. It can be mounted on either the left or the right side, but for simplicity's sake with my personal preferences, I have mine mounted on the left hand side, for strong side recovery, which is the fastest and easiest way I use it. I have it mounted level with the rig's MOLLE real estate, and two columns from the center, to keep it slightly off center and to keep the zipper clear. This also allows me to pull two zip ties through the polymer housing and through the remaining MOLLE at the front to tighten the unit down more to the rig itself. The shoulder pads are large and comfortable, allowing you to carry a heavy load on this rig with a minimum of strain. If you set it up properly, most of the weight will be carried on your torso, with the shoulder straps just there to keep the rig in place. The pads are free to slide along their straps, ensuring you can position them to your preferred positioning. Not everyone has a F.A.S.T. System, but this rig can still be considered a good choice for them, due to the fact that at its heart, it's just a MOLLE chest rig. Each side offers 9 columns and 4 rows of MOLLE real estate, allowing you to mount whatever combination of standard magazine and general purpose pouches you can fit. I currently have the F.A.S.T. System on the left panel, with an Eagle Industries triple M4 magazine shingle on the right, purchased from TacticalAirsoftSupply.com. They stock a very large amount of Eagle gear, so if you're looking for some of the best gear, they're a great place to look. The shingle works perfectly with the rig, and is also covered by Eagle's lifetime guarantee. The back piece has 2 columns and 4 rows, which is enough to mount some of the smaller hydration units by Camelback and others. Eagle Industries doesn't skimp on materials or labor on their products, and this rig certainly shows that. All of the stitches are reinforced with double or triple layers at potential failure points. The MOLLE straps are double stitched vertically, then diagonally reinforced again along the entire length. The material used is 1000D Cordura, which should take anything an airsofter can throw at it. The straps used are quite strong while still remaining flexible. They feel similar to a seat belt, only a touch thicker. The zipper used is a self healing YKK design. Long story short, this is a real rig designed for real combat. It'll take airsofter abuse with no problems, and IF you do have a problem, Eagle will repair/replace it for free. I was never too into gear personally until fairly recently, but the bug has bitten hard. Iâ€™ve used my fair share of ACM gear, and seeing the difference in quality with gear like this is just astounding. Now, for airsoft, for the most part, you don't NEED 1000D Cordura and triple stitch reinforcements, etc, but the fact that you can have them at a very affordable price with this rig means that you don't need to skimp on quality to save a few bucks. This rig has replaced both rigs I used to use, and I foresee a lifetime of satisfaction from it! Many thanks again to STRAC Technologies, Deadrag Airsoft Radio and of course, AirsoftRetreat!